The engine turns over on the kickstarter but has been a non runner for a number of years. V5 present in my name and currently SORN. In need of complete refurbishment and a nice project but I have no time. What you see is what you get. New battery included. Buyer collects from GU8 5BH and cash on collection please. No offers. 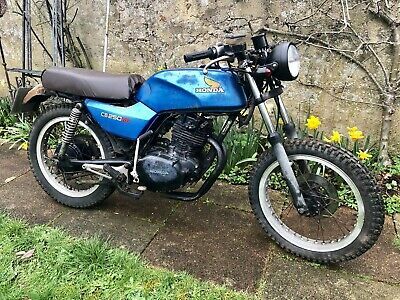 This Honda Cb250rs Motorcycle Project Cafe Bobber Scrambler Spares Or Repair is located in Godalming, GU8 5BH and is being sold on eBay by wildthinair.